My summer vacation of 2017 contained several interesting adventures, none of which could parallel the wilderness camp. Camp Tirthan is a riverside camp located in a UNESCO World Heritage Site in the Great Himalayan National Park. The pristine waters of the Tirthan River and the surrounding gentle slopes, with proximity to over 400 species of flora and fauna, made it a picture-perfect campsite. 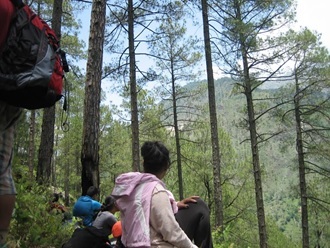 On Day 2, we took off on an off-trail trek up a mountain covered in slippery pines, bristling bushes, and steep climbs. The hike started off easy enough, a couple of natural stairs smothered in leaves and spider webs. We started off in high spirits, smiles abound, full of laughter and gossip. We reached a small clearing and sat down to take a breath and listen to some instructions. Mosquitoes buzzed around, the shouts of the other group were audible in the distance. Suddenly, we heard a scream and the give of some rocks tumbling down the mountain. One of the younger instructors had mis-stepped and tripped on some large rocks. Obviously, the rest of froze in shock. If a fit, experienced trekker could make a possibly fatal mistake on this mountain, how would the rest of us fare? We gulped and looked at each other, shaken. Our instructors noticed and cajoled us, with a hint of caution in every small step. It was around a quarter of the way through the hike when I lost it completely. By that point, I had slipped off the mountain three times, and was not looking forward to the fourth. Stopping to take a breath, already at the tail end of the group, I leaned on a tree to gain my footing. In my mind, it could not be any worse. Ready to cry and scream, I got down on my hands and knees, and started crawling. I didn’t have the courage to stand on my two feet. The instructors told me to get on my feet, but I was dragging myself through poisonous bushes, prickly thorns, and what I could only hope were benign insects. I slowly and steadily covered the ground that my fellow campers hopped, skipped, and jumped over. When I finally reached the summit of the mountain, after slipping a couple more times, everyone had already claimed their resting spot and were feasting on biscuits. We sat in silence, gathering our thoughts, the sun burning our noses, and soaking up the moment. You know how they say, “the view was worth the climb?” That scene was the prettiest, most serene sight I have seen in my seventeen years. The tall trees, the snaking river, the bright sky, the golden pines made it all worthwhile. Everyone felt the same way – what an incredible view for such a laborious trek. I started thinking about my normal life, full of stress and negativity. Meditating at the summit showed me that there was a happier alternate. But to get there, I would have to work incredibly hard, pushing myself out of comfort zones, and maybe get scratched a few times. I had battle scars up and down my arms and legs for weeks after that hike. My friends still laugh at my unorthodox way of trekking the mountain. In the future treks, I still hiked slowly, but never on my knees again. These small steps of progress brought many cheers and rounds of applause. That first journey was easily the worst and hardest part of the camp, ranking in one of the worst experiences of my life. But that view, ranks as one of the best.